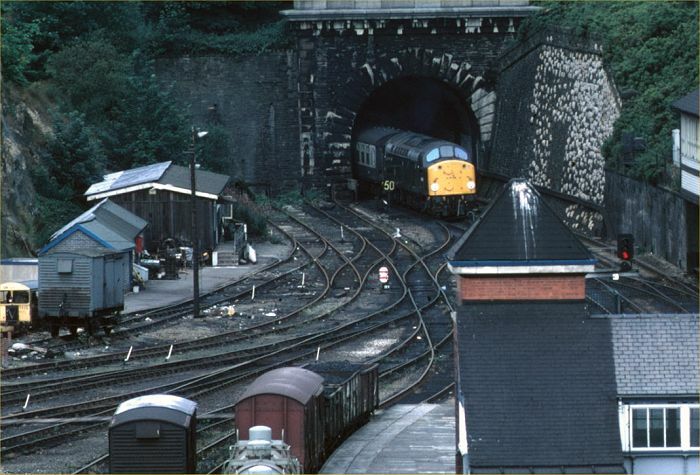 It's the 4th September 1979, and 40106 emerges from Belmont Tunnel, Bangor with the ECS to form the 11:30 to Manchester Victoria, having previously run-round the train and propelled it into the tunnel. 40106 was already a 'celebrity' loco, being the last class 40 to remain in green livery. The other local celebrity - 24081, the last class 24 in service - was also in the station at this time. The picture was taken using a 400mm lens, dramatically compressing the distances, and showing up the yard trackwork, with its double headshunt. In the foreground, coal and chemical wagons wait to travel to Gaerwen and Amlwch respectively.